The leader of the team working to restore and fly a Vulcan bomber said money problems were making the project difficult to keep going. Andrew Edmonston of the Vulcan To The Sky Project said the charity is still trying to raise sponsorship to keep the aircraft in the air. But the economic downturn is affecting the firms who might sponsor the plane. He said morale is low even though an estimated 3.8 million people have seen the aircraft this summer. "Our heads are down now - the morale is down as it seems we are losing the battle. It is a very difficult time." Some investors are reluctant to get involved with an aircraft that was an ex-nuclear bomber - even though it was operated as a peacekeeper, he said. "We only recover a portion of the operating costs of the aircraft at air shows and have to make up the rest from philanthropic or sponsor or merchandising. We are running a loss each flight." Mr Edmonston, the Vulcan trust's engineering director, said a final decision will be made in October on the future of the Vulcan. "I just hope we will not lose this aircraft for the nation - I hope someone will take it forward," he said. Five specialist engineers - who are all volunteers - are keeping the plane flying. 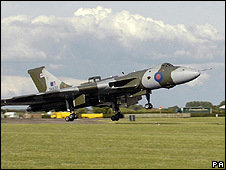 The Vulcan was restored at the airfield in Bruntingthorpe, Leicestershire, where it has been kept since being decommissioned in 1993. It was based at RAF Waddington in Lincolnshire when it was operational. About 20,000 people have contributed to the restoration fund for the bomber. A total of £2.7m funding has come from the Heritage Lottery Fund. The Vulcan, which has taken 15 years and £7m to restore, was given permission in July to fly at air shows.